Today we look at STILL, a solo exhibition of video and animation works by Pia Maria Martin at The McLoughlin Gallery in San Francisco. It is the first US solo media exhibition for Martin, who hails from Stuttgart, Germany. Martin’s work involves elaborate stop-motion films assembled meticulously from countless photographs. Stop-motion animation assembled from photographs is currently a strong interest of mine and an art-form that I have been exploring in my own recent work with silent video and live music, so I was quite excited to see this show and meet the artist. Upon entering the gallery, one is greeted by a large triptych featuring a procession of plastic red chairs. The piece, entitled Zum Appell!, can be a little jarring with its inanimate objects marching in lock stop, but it is also playful for the exact same reason. I also like the mid-century modern chairs against the weathered concrete interior. The surreal animation of the chairs and design elements are both enhanced by the nearly life-size presentation. The elements of both play and unexpected animation are apparent in many of the other pieces as well. Für Olga tends towards the more abstract with mechanical and industrial elements that defy gravity, as do her most recent pieces such as Scherzo with brightly colored ribbons curling and “dancing” in a stark white industrial space. Kalekeitos takes the animation of fish in a more playful (albeit morbid) direction. As someone who tends to anthropomorphize animals, I found the dancing fish in Kalekeitos quite endearing. But of course the fish (which are in fact already dead) are ultimately dancing towards their destruction as part of a soup or stew. Death and decay appear as subjects in several of Martin’s animations, with natural elements falling apart or becoming reanimated. It also plays into her piece XI which features a house demolition in progress. The simple geometry and gray quality made it more captivating than a simple chronicle of demolition and gave it the more abstract quality found in some of the other pieces such as Scherzo. This particular work was also great example of pairing music with the silent animation. Music plays an important role in Martin’s work, not only as an accompaniment to the visuals but as an organizing principal. XI featured Arnold Schoenberg’s Die Jakabsleiter performed by Pierre Boulez and the BBC Orchestra and Singers, which reflected the geometric nature of the visuals. In Scherzo, the second movement of Anton Bruckner’s Symphony No. 9 is used as a “non-audible score”, although the actual music is performed by the artist friends (as described here). Once again, my own artistic interest in the silent-animation medium intercedes as I would love to do a live musical performance to one of her films someday. Pia Maria Martin was able to be in San Francisco for the opening. In addition to introducing her work, she participated in a more general discussion of video and animation. The lively and far-ranging discussion included the artist’s techniques and inspiration, as well as more general topics such as what it means to “collect video art” in this day and age. On a practical level, the pieces in this and other video shows are authoritative limited editions, much like photographic prints. Some of them are also objects that include the means of display (e.g., a flat panel screen and DVD player). But for a local art collecting community that tends to be a bit more conservative in its acquisitions, the idea of an art piece to be displayed on a TV screen or projected onto a wall and which requires media intervention to perceive is a new one. But we hope video art continues to make its way into collections. The exhibition will remain on display at The McLoughlin Gallery through May 30. It’s interesting to consider in the context of the recently released LZX analog video modular synthesizer. 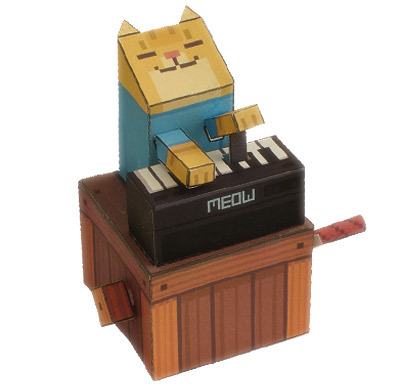 CatSynth pic and video: keyboard cat papercraft tribute. This is the happy papercraft keyboard cat assembly instruction video. please watch the happy video for instructions and things to see and do and scary, please don’t blink. This video came via our friend synthmonger. It was part of something called neave.tv, basically a custom video-channel application the web that plays a selection of syndicated material from YouTube, Google Video, and elsewhere. Synthmonger was actually calling attention this particular video featuring pjtoro's musical suit appearing on a Russian or Eastern European TV show. The suit appears to be a series of synthesizers controlled by body sensors. Pretty cool. The feline-themed models are a nice touch, too (hey, this is “CatSynth”). More detail can be found at pjtoro's site, including design information, more images/videos and even an interactive flash simulation. Back on neave.tv, I found a few other interesting videos. Most intriguiging to me was the a work called Sixes Last by 1st Ave Machine, a design and animation house located (surprise) on 1st Avenue in New York. They did an amazing job of blending natural elements with surreal biology. You have to think about it for a few moments to decide whether it's real, completely animated or manipulated in some fashion.